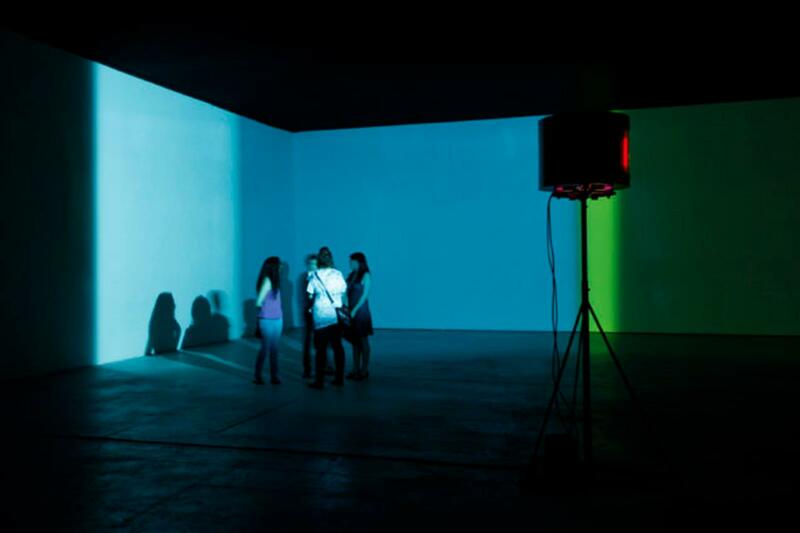 Sua fogueira cósmica (Your cosmic campfire), 2011, is a dynamic light installation created by means of a specially constructed lamp, reminiscent of a lighthouse lantern, mounted on a tripod in the centre of a darkened space. The light at the centre of the lamp shines through four concentric cylinders made up of a black metal framework into which cyan, magenta, or yellow colour filter foils are inserted; the outermost case is additionally fitted with a narrow piece of black metal that functions as a blind. Motors cause all four concentric cylinders to revolve at different speeds and in different directions. 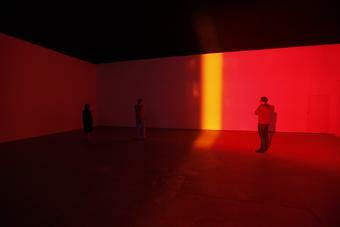 The mechanism creates a random sequence of colours and shadows. The light is precisely directed so that it moves along the vertical surface of the walls only, omitting floor and ceiling. The entire space appears as a slowly moving and transforming horizontal band. The brightly lit visitors become performers, their outsized shadows cast onto the walls, into the colour fields. 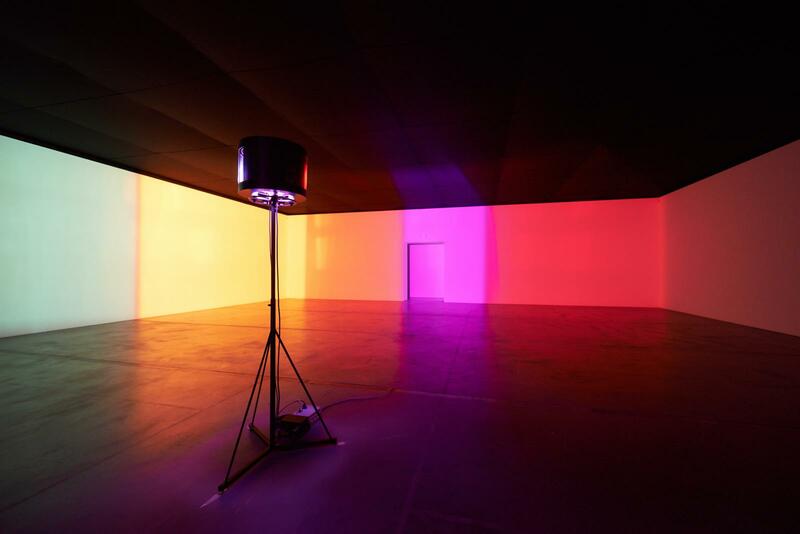 At the same time, the slowly evolving hues of the projection allow the viewers to observe and examine the mechanisms of colour perception, a recurrent topic in the artist’s work. 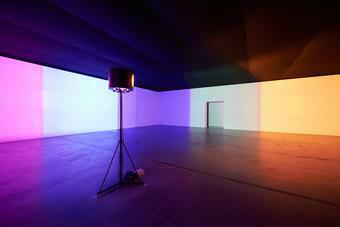 The theme of mapping space by means of – static or movable – colour coding can also be observed in works such as Five orientation lights, 1999, The movement metre for Lernacken, 2000, or I only see things when they move, 2004.Sua fogueira cósmica (Your cosmic campfire), 2011, is a dynamic light installation created by means of a specially constructed lamp, reminiscent of a lighthouse lantern, mounted on a tripod in the centre of a darkened space. The light at the centre of the lamp shines through four concentric cylinders made up of a black metal framework into which cyan, magenta, or yellow colour filter foils are inserted; the outermost case is additionally fitted with a narrow piece of black metal that functions as a blind. Motors cause all four concentric cylinders to revolve at different speeds and in different directions. The mechanism creates a random sequence of colours and shadows. The light is precisely directed so that it moves along the vertical surface of the walls only, omitting floor and ceiling. The entire space appears as a slowly moving and transforming horizontal band. 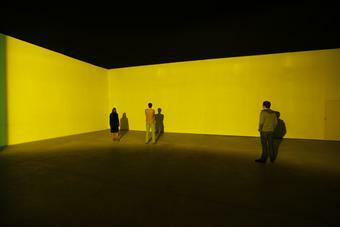 The brightly lit visitors become performers, their outsized shadows cast onto the walls, into the colour fields. 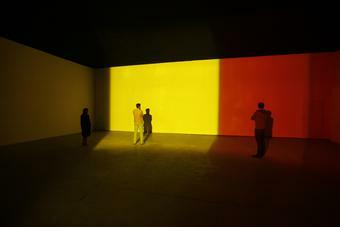 At the same time, the slowly evolving hues of the projection allow the viewers to observe and examine the mechanisms of colour perception, a recurrent topic in the artist’s work. 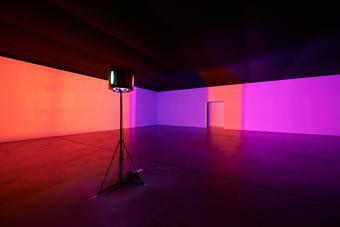 The theme of mapping space by means of – static or movable – colour coding can also be observed in works such as Five orientation lights, 1999, The movement metre for Lernacken, 2000, or I only see things when they move, 2004.